What do we do when we don’t know what to do? – and how do we ensure that whatever we do is the right thing to do? How do we make sense fast, at business-speed? The horizontal green-line axis here represents the decision-type, from a simple true/false choice to a not-so-simple modal choice of possibility and necessity; the vertical red-line axis is the amount of time available before must make a choice and take action. [For more on SCAN and its technical background, see the posts ‘“Let’s do a quick SCAN on this”‘ and ‘Domains and dimensions in SCAN‘. At each moment of ‘right here, right now‘, it’s always our responsibility – our ‘response-ability’, our individual and personal ability to respond. 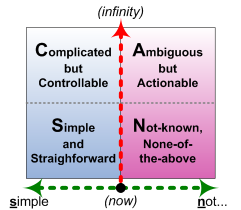 The ‘now’ is the still-point at the centre of action. Yet it’s an active stillness, and there are still choices there in that moment. So what we aim for in this kind of real-time sensemaking is to create just enough space to enhance that ‘ability to respond’ – enough space to enable appropriate choice for appropriate action. If we don’t create that space for choice, the only ‘choices’ we have come from habit – which may not be appropriate to to the context – or the various ‘hard-wired’ reflex-responses, such as ‘fight’, ‘flight’ or ‘freeze’. Whilst it’s easy enough to describe what goes on either side of that choice-point, it’s surprisingly hard to describe the choice-point itself without sounding somewhat mystical. Rather like the cosmological moment of the Big Bang, it’s both technically and literally a moment of chaos, within which the ‘normal rules’ break down, and which contains within itself every possibility and every other point. What we need to do instead is stay within the ‘chaos’ for as long as we can, to allow the appropriate choice to emerge from and with the context itself. Describing this as ‘act / sense / respond’ is way too simplistic: it’s more like a real-time dance of choice and action, a transitory yet immensely powerful condition of flow that is often experienced as a kind of ‘no-time’ that is seemingly beyond time. What I’ve been working on over the past few days or so is trying to a detailed mapping of what actually happens in the real-time space, using this specific question of real-time sensemaking as the ‘target problem’ to keep in focus. In real-time sensemaking we actually swing back and forth between these ‘domains’, using a variety of real-time checks to tell use which side we need to be on at any one moment. They’re different disciplines: but by swinging back-and-forth in a conscious and deliberate way, we maintain an overall discipline at all times. – [S] is about following the instructions, following ‘the rules’; [N] is about allowing ‘the answers’ to arise in whatever way they seem to choose. – [N] is what we do while that ‘inner knowing’ lasts; [S] is what we do when the knowing fades. – Both sides need calm, and need discipline – including the discipline about how and when to switch back and forth between them. – [S] has notions of ‘truth’, of ‘control’, of certainty, “I know what to do”; [N] calls for a kind of faith, a lot of trust, perhaps Susan Jeffers‘ “feel the fear and do it anyway” – and often a difficult balance between “do something, don’t just stand there!” and “don’t ‘do something, just stand there…”. – In a rework of the old slogan “think global, act local”, [S] seems to focus on ‘act local’, whilst [N] seems to allow the broader space of ‘aware global’ – no time to stop and think at real-time, yet use that deep-space of ‘the everything’ to help maintain the big-picture awareness. Anyway, that’s it for the moment. It’s just a work in progress, as usual, but make of it what you will.